(All names refer to gears designed to use with heavier springs, 130 and above). I'm just going to cover some of the basics here and try not to get TOO technical. Basically, high-torque gears use more teeth on each individual gear to make it easier for the AEG's motor to pull the heavy spring back and release the piston. If you've ever paid attention to the different size gears on a 21-speed mountain bike, it's sort of the same principal as using a high gear on the bike to help you climb a steep hill. When you use the higher gear on the bike, which has more teeth, you'll notice you're having to pedal more often, yet you make less progress moving forward than you would on flat ground and using a lower gear with less teeth. However, it's much easier to deal with the forces of gravity pushing/pulling against you using those extra teeth. Yea, that is my terrible analogy. Please forget about it immediately in the event it does not make sense to you. There are probably better examples out there. Since they have more teeth, high-torque gears have a higher overall ratio, anywhere from 23:1 or all the way up into the mid 40s:1 for Super/Infinite Torque-Up gear sets from various manufacturers. You'll also see a number of the high-torque gear sets being offered in what's called the "helical" variety. 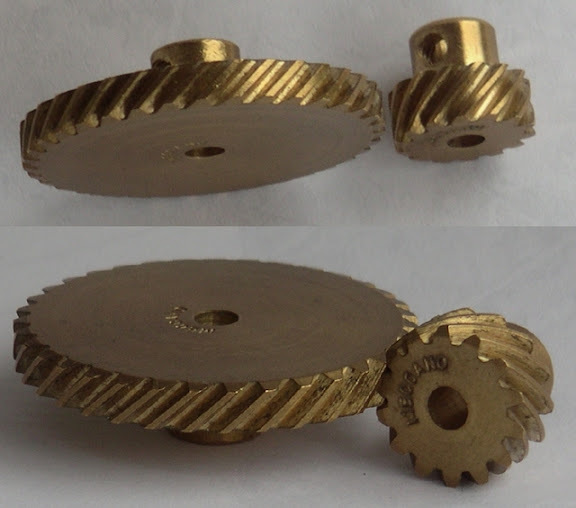 Helical refers to the angle at which the gear's teeth are cut. They are not cut like the commonly-used spur-type gears found in pretty much all stock Airsoft AEGs. An interesting, yet highly irrelevant factoid about helical gears is that they are not only functional when run in parallel (Top pic) with each other, like in an Airsoft AEG gearbox, but they can also mesh together and work when the gear shafts are situated perpendicularly to each other (Bottom pic). This has nothing to do with Airsoft, I just thought it was kind of cool. You're welcome. Helical gears are said to be better suited for high-torque environments because of the science/physics behind the way the angled teeth mesh with one another. I'll also acknowledge that there are others with enough credibility in the engineering field that I respect them, who feel that helical gears in an Airsoft AEG do not yield any real significant advantage over using the more common, spur-type gears. I'm not sure I'll ever get to the bottom of that one, since my knowledge of physics is limited to the forumla, Distance = Rate x Time, or something to that effect. That may not even be correct, which would mean that my knowledge of physics is equal to Absolute Zero. Anyway, if in fact I believed that there wasn't any real advantage, I would just use spur-gears because helical gears are much more difficult to shim in the gearbox, at least in my experience. Also, the general consensus from the various engineering sites I've read up on regarding these helical gears is that they are also more quiet than spur gears. However, while I haven't done any official audio analysis testing of this theory, it seems to me like the helicals that I use in my M14 DMR, for example, made the gun louder than it was when I was running the spur-types. Could be just my imagination, but I am thinking about testing this out since I happen to have the gear to do so. It'll take some time for me to prepare for such a test in order for it to be done properly, but I think I'm going to try and make that happen. If you've got any suggestions, tips or tricks on the best way to compare the loudness of a helical gear set vs a spur gear set, feel free to post them up here on the blog. While I've already got a good enough idea of how such a test should be conducted, I'm always open to new ideas. An important thing to note about helical gears is that as the gears mesh together, they can produce quite a bit of friction as they rub together. Therefore, it's important to use a good white lithium grease and apply it to your gear teeth. I just use a q-tip, dipped in the grease and apply a light coating to my gear teeth. Speaking of things I personally use, I like to apply white lithium grease with a PTFE (Teflon) additive in it on my AEG's gears. It's rated for extremely high temperatures and recommended for use with gears, per McMaster-Carr. Another very important and often overlooked item about Super-Torque/Infinite Torque-Up gears with the higher ratios around 40:1 or whatever is that because they utilize so many more teeth while keeping their overall size the same as all other Airsoft AEG gear sets with less teeth, some of the high-torque gear sets require the use of a half-tooth piston in order to accommodate all the extra teeth on the bottom half of the sector gear that stick out past the smooth, toothless section of the Sector's top half. Do you see how the teeth on the bottom half of the Sector gear stick out past the smooth, toothless section of the top-half? See how the teeth on the bottom half don't stick out past the toothless section of the top half? You can use a full-tooth piston with this type of Sector gear, while you'll need the half-tooth, like I said, for the Sector gear in the first photo. I think that covers most of the BASICS regarding high-torque gears for the upgraded, high-powered Airsoft AEG. FYI, which is an acronym standing for: "Airsoft."